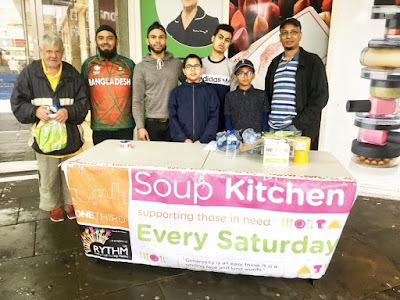 On the eve of the much anticipated Greater Sylhet Cup at Mabley Green in Hackney we took to our soup kitchen with homeless friends at Stratford City. I have the good fortune of managing these boys again this year and I was joined by team captain Abdul Wahid and a bunch of awesome nephews in tandem. The captain led by example and this has inspired lots of others already. This is the greatest benefit in volunteering - You can enjoy doing something and at the same time influence others massively. My neighbour works at the Royal London Hospital as an NHS manager and he and the missus provided delicious Biriani. In fact the food was so popular that it was all gone in 19 minutes and we had to share the last container between two homeless friends. One thing abut our Beanibazar team is the focus we have on community issues. For two years running we have welcomed Beanibazar Cancer Hospital as a charity partner using the Barcelona ethos whereby we raise funds for this fantastic project. 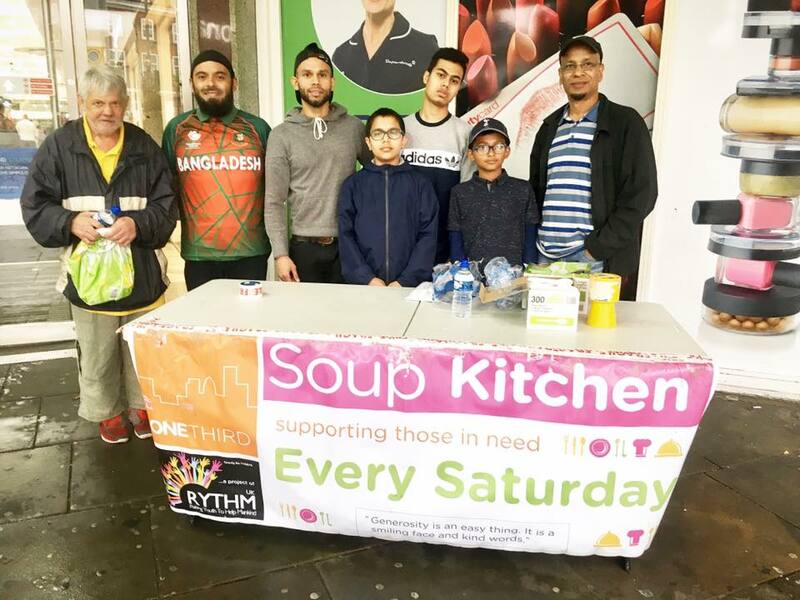 Just like the Catalan giants charity and active citizenship is key within our squad and there are at least half a dozen squad members who are seriously active in our community carrying out a number of roles which includes supporting the elderly, those who are disabled and people affected by poverty. The kids seemed to enjoy the experience and will appreciate the efforts of the adults in future years. I could tell that the interaction with fellow humans who have no home left them all thinking about their own lives and one told me how privileged he was in comparison to the people he served. Billy and Paul were their usual lively selves but there was no Amanda or Rosie today. The number of families affected by homelessness is expected to more than double in the next two decades, with a further 200,000 households affected by 2041. The numbers of those who are sleeping rough will soar by fourfold to more than 40,000 in the same period, according to research by Heriot-Watt University, commissioned by Crisis, the homelessness charity. Whatever happens at the Greater Sylhet Cup tomorrow will pale into insignificance when you take stock of the situation and how worse off our fellow citizens are. If we win it I'll bring the trophy to the next soup kitchen and pose with my mates there. If we don't our work here continues regardless and I'll have to do it next year. The Greater Sylhet Cup takes place at Mabley Green tomorrow so do pop over and say hello. The ususal big boys will be favourites but my insight from refereeing some friendlies tells me that Biswanath and Chattak will be serious dark horses and contenders.